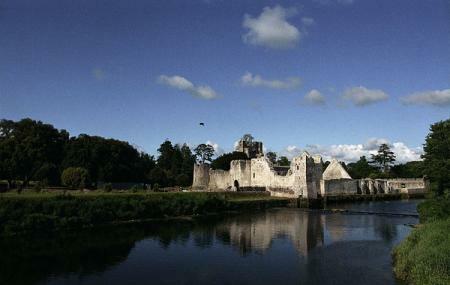 The gem of Askeaton is Desmond Castle. Perched on a rocky island on the banks of the Deel River, the castle is in the center of the town. The castle dates back to 1199. Since then, after changing hands and undergoing structural changes, the castle we see today is a result of the year 1348. The castle, once upon a time, used to house a community hall, a banquet hall, a church and clubs. The castle is built partially in the most exquisite limestone and decorated with stained glass windows. It is also surrounded by a lush garden, covered in lawn and bordered with tall trees. Create a flawless plan, make use of Askeaton trip planner. You can add cozy hotels in Askeaton like Ballycannon Lodge, Rathkeale House Hotel, The Courtyard Guesthouse and Bunratty Castle Mews B&b. If you want to add the visit to Desmond Castle in your trip, you can choose from the variety of Askeaton vacation packages that can be designed to suit your preferences. These packages also cover your major concern of how to reach Askeaton. Love this? Explore the entire list of places to visit in Askeaton before you plan your trip. Fancy a good night's sleep after a tiring day? Check out where to stay in Askeaton and book an accommodation of your choice. Absolutely amazing experience. The staff were super friendly and knew the entire history of the Manor and family. I will definitely be returning in the future! This was one of my favorite castles that I visited while traveling through Ireland. Our tour guide was exceptional. She was extremely knowledgable with great delivery. My husband and I were 5 minutes late for the last tour and the woman at the information center called the tour guide and had her wait for us. We were able to drive right through the castle Gates and join the tour just in time. She even covered information that we missed from being late at the end of the tour. Nothing like Irish hospitality and story telling. The yew trees in the castle grounds are over 500 years old and a sight to behold! This is also a heritage site for those travellers wondering. Magnificent manor on beautifully landscaped grounds,very popular tourist attraction & fabulous golf course. What an amazing tour! So awesome. Go to the tourist Info center and there's a stand where you can purchase tickets. Seriously highlight of adare. You get to go into the castle!! Great tour and a fabulous day out in a small town. The charm, cuteness and simplicity will bind you for long. Definitely do the tour as it will be a pleasant surprise.